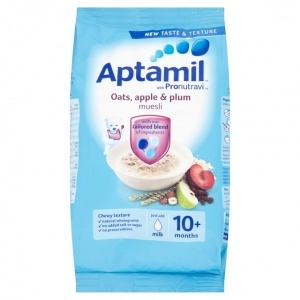 Fortified muesli with oats, apple and plum for babies from 10 months. 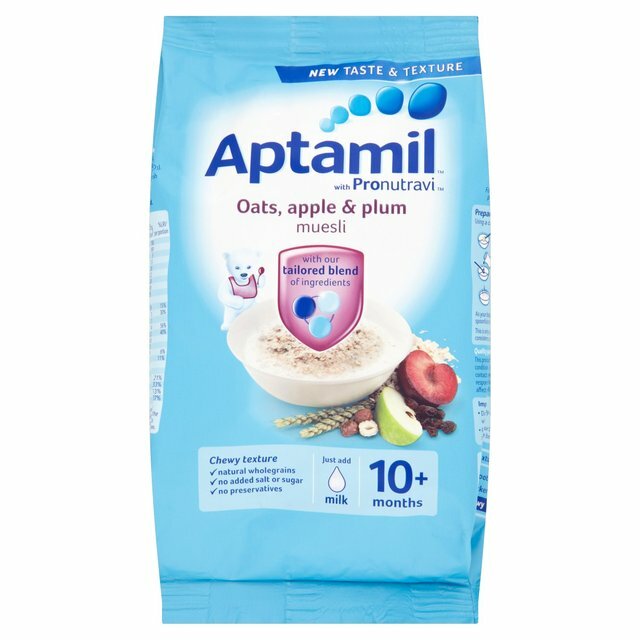 They've been pioneering research into infant and toddler nutrition for over 50 years to help you give your baby the best start in life and ensure only high quality grains and fruit are selected and then combine these with our tailored blend of ingredients, Pronutravi. Vitamin B1 - complement a healthy balanced diet. Vitamins C and D - Vitamin D for normal bone development. Offering your baby a wide variety of foods along their weaning journey is important as they start to form their taste preferences. Our unique range of cereals for 10+ months are specially tastes and a chewy texture as your baby progresses. Per 100g dry product : Energy (kJ) 1524, (kcal), Fat (g) 6.3, of which saturates (g) 0.8, Carbohydrates (g) 63.6, of which sugars (g) 18.8, Fibre (g) 6.5, Protein (g) 10.1, Salt (g) 0.03, Vitamin A (µg-RE) 59, Vitamin D3 (µg) 3, Vitamin E (mg α-TE) 1.1, Vitamin C (mg) 15, Thiamin (B1) (mg) 0.5, Niacin (B3) (mg)0.8, Pantothenic acid (mg)0.3, Vitamin B6 (mg) 0.04, Folic Acid (µg) 11, Biotin (µg) 1.4, Calcium (mg) 80, Iron (mg) 3, Zinc (mg) 0.5, Iodine (µg) 40, *Made with 35g cereal and 90ml Aptamil1, 1LRV (Labelling Reference Value) is a guide to the amount of vitamins and minerals needed per day to meet the requirements of infants and children. Small soft pieces of food are best once your baby can happily chew mashed foods, because the next step is for your foods, because the next step is for your foods, because the next step is for your baby to become used to food that is chunkier. Why not add small fruits like blueberries or small chunks of bigger fruits such as mango, for a great taste and the right texture? Mix 1 spoonfuls of your baby's usual milk. As your baby's appetite grows use more spoonfuls to make a bigger serving.